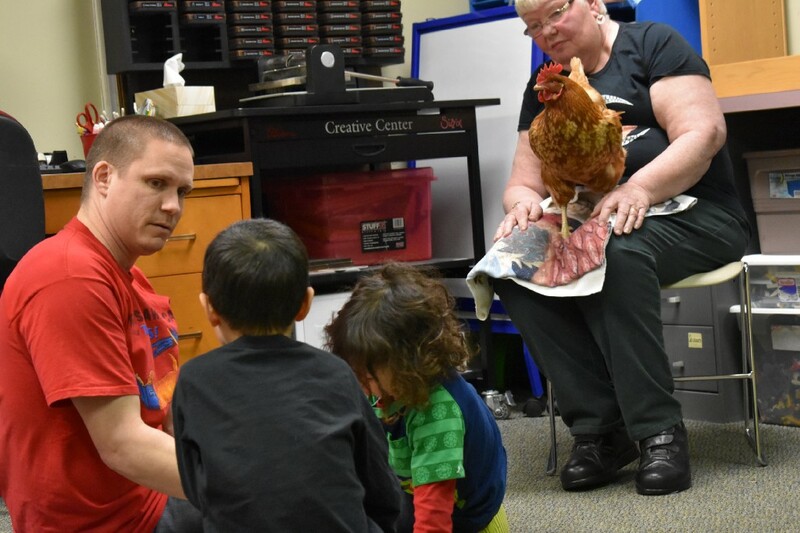 Although talking loudly in a library is typically frowned upon, clucking certainly isn’t at Pinelands Branch Library, where it welcomed a not-so-typical guest last Tuesday. Paws to Read, a program that allows children to read to therapy dogs, was implemented at the library a few years ago, according to Pinelands librarian Rick Yankosky. 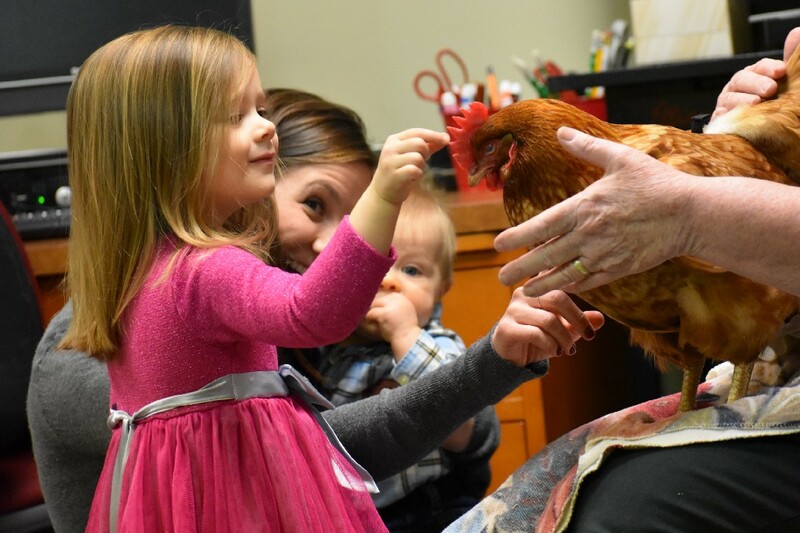 This time, however, it was Rosebud — a certified therapy chicken — who served as their audience. Librarian Rick Yankosky helps Julius and Elijah Harvey read to Rosebud. The library’s first “Chicken Paws to Read” sparked a lot of interest, according to Yankosky. While chickens and children altogether seem like a chaotic combo, Rosebud couldn’t have been calmer. Baile said she participated in 102 events with Rosebud in 2017 — including visits to the elderly, school science fairs, fall festivals, children with disabilities and more. But this was the first event where children were able to read to Rosebud. “I just get a kick out of the kids,” said Baile, who sat Rosebud on her lap throughout the duration of each reading session. Despite the children showing some initial shyness to approach Rosebud, or even sit too close, they were ultimately pleased to pet her, and intrigued by her “Swedish fish-like” comb, as Baile best described it. Yankosky explained the program is aimed to get kids more comfortable with being around animals, as well as give them a non-judgmental audience to read to. Sisters Larissa and Abigail Sheridan of Medford, NJ, take turns reading a book to Rosebud. Baile said the idea of a therapy chicken isn’t much different than a therapy dog. One advantage of a chicken, Baile noted, is their uncommonness. 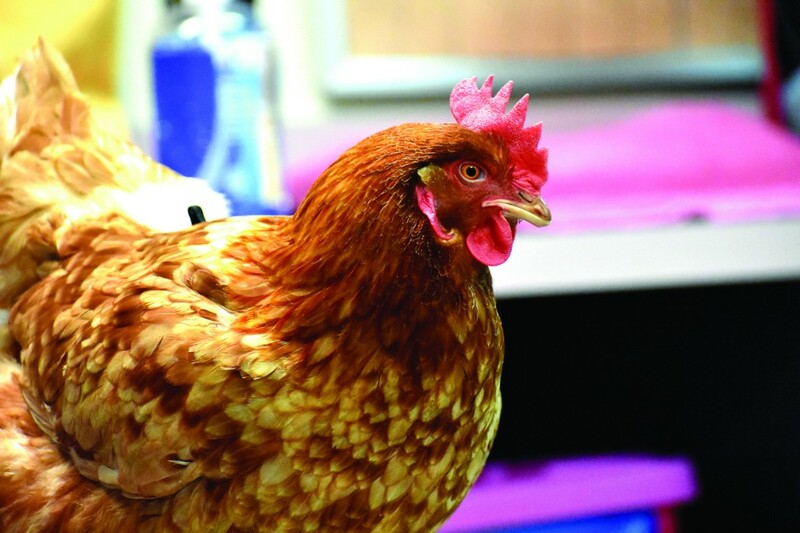 However, according to Baile, not all chickens have what it takes to become therapy animals. Rosebud sits on the lap of her owner, Gwenne Baile. Baile told the children that the red comb at the top Rosebud’s head feels like a Swedish Fish candy. 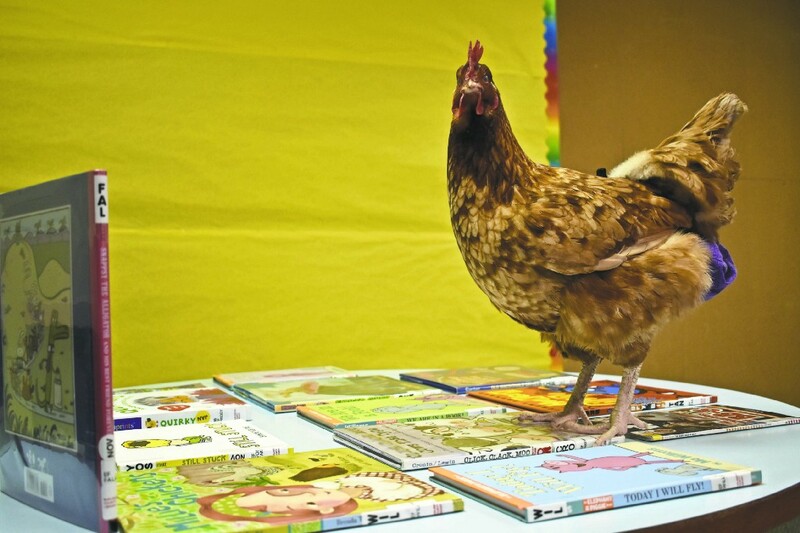 As if Rosebud the therapy chicken didn’t leave behind enough of an impression at the library, she also left behind “The Little Red Hen,” a book she donated to the Pinelands Branch library — and autographed — with a footprint.